According to UN estimates, around 60 million people worldwide are currently in search of refuge. Many of these refugees turn to Europe as a beacon of hope, but their journeys are often fraught with difficulty, and since 2000, over 28,000 people have died trying to enter Europe. The Migrants’ Files project was launched in 2013 by a group of European journalists who joined forces to accurately calculate and report the deaths of emigrants to Europe. They wanted to have exhaustive and up-to-date information so as to be able to hold their politicians to task, as well as show the scale of the problem across the continent. The Migrants’ Files team has created a comprehensive database of information on migrant deaths, in collaboration with United for Intercultural Action, and Fortress Europe. The database also uses data from PULS, a project run by the University of Helsinki, Finland. The team keeps track of fatalities by monitoring real-time news on asylum seekers, migration and human trafficking activities in and around Europe. Data is logged according to name, gender and nationality. Every incident is recorded with its date, latitude, longitude, number of dead and/or missing as well as the cause. The locations of the tragedies are pinned on an interactive map, with a heatmap to highlight hotspots. A second map uses data from The Migrants’ Files to allow users to examine a timeline of migrant deaths across Europe dating back to 2000. The work is ongoing and contributions are welcome by emailing debug@themigrantfiles.com or get in touch using the Twitter hashtag #MigrantsFiles if you would like to help. For quarterly updates on the migrant situation you can sign up for the newsletter via the website. 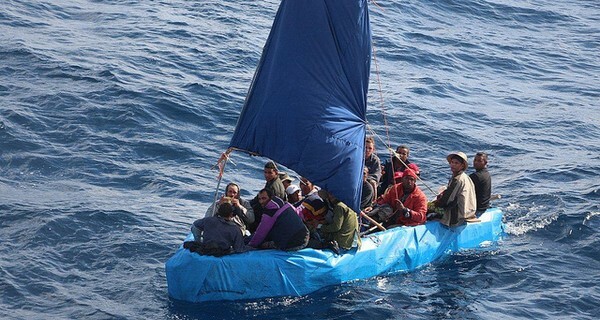 Image 'Migrant Interdiction' courtesy of Coast Guard News.